Danielle Hobbs explores ideologies, contradictions and complexities of ‘good’ and ‘bad’ motherhood with her labour intensive, fastidiously crafted wardrobe of clothes for her children, offering a poetic response to the artist’s first-hand experience of Postnatal Depression. Hobbs’ meticulously constructed garments are enriched with talismans, amulets and charms, and laced with traces of strangely familiar, slightly subverted fairytales and myths. Their construction incorporates the psychological agency of biological materials such as collected hair, eyelashes and nails from family members as well as materials collected from native and introduced animals such as echidnas, galahs, the fox and the European rabbit. Fight or Flight takes its name from the psychological reaction that occurs in response to a harmful or threatening situation. 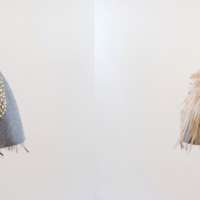 It is a reversible caplet; one side is stitched with a bib shaped collection of porcelain human teeth replicas, the other has a generous covering of feathers from an important Australian cultural icon and (ironically) flightless bird, the Emu. The article of clothing made for the artist’s daughter can be worn baring teeth or displaying feathers depending on the chosen response to a situation. The work embodies the dual purposes of watching over the child in the mother’s absence and shielding the child from the ‘bad’ mother’s presence. These protective garments make manifest Hobbs’ hopeful coping mechanisms that enabled her to navigate and overcome her darkest moments of Postnatal Depression. “Danielle Hobbs,” Artist Parent Index , accessed April 22, 2019, http://www.artistparentindex.com/items/show/179.